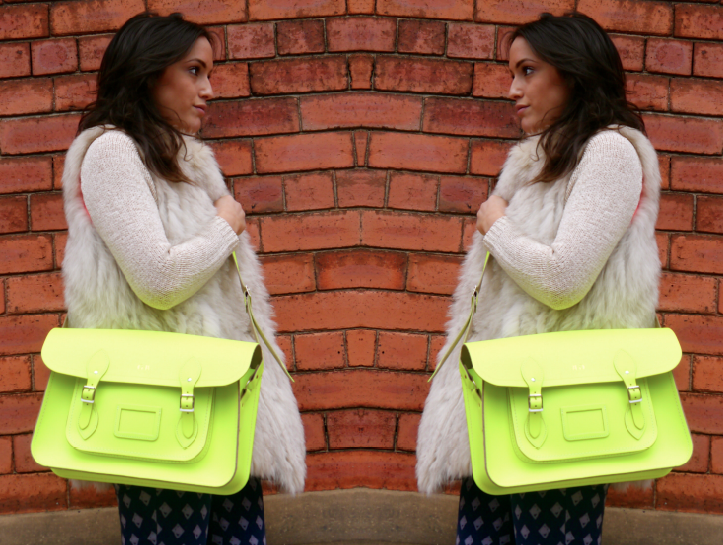 What I'm Wearing: Vintage Fur Vest, Never Fully Dressed Neon Back Knit, Gap Jeans, Kurt Geiger London Calling Sneakers & Cambridge Satchel Company Fluro 15" Bag. Say hello to my new Cambridge Satchel Company baby! As most of you know it was my birthday yesterday and this little neon number with my initials on was the icing on the cake. Had an absolute glorious day full of obscene amounts of food was absolutely spoilt rotten with amazing presents from my friends and family. And to top it all off, I got my dissertation bound and handed in, I've been bouncing around the apartment ever since. That bag is gorgeous! I love this look. LOVE that bright color for a purse! and your sweater is so pretty and versatile with the neutral color on front and that beautiful shade of orange on the back. You look wonderful! Very pretty! I'm glad you had a good birthday! I love your jumper. Cambridge satchels are such good quality and your looks lovely. I was looking at them in Selfridges and they have such a good range of colours for summer. It's gorgeous tho Im not a huge fan of neon. I love the fur vest!! Ok - the bag is very beautiful - but I LOVE!!!!!!!!!!!!!!!! the bottoms!!! You satchel is really amazing!!!! I'm so jealous, I want a cambridge satchel and in this colour!! Followed on bloglovin! Thanks for stopping by and glad you like the blog :) Loving the yellow neon mixed with blue trews and gold sneaks - totally excellent look. And a happy birthday too! Keep in touch. :O you have a csc satchel... Jelous! 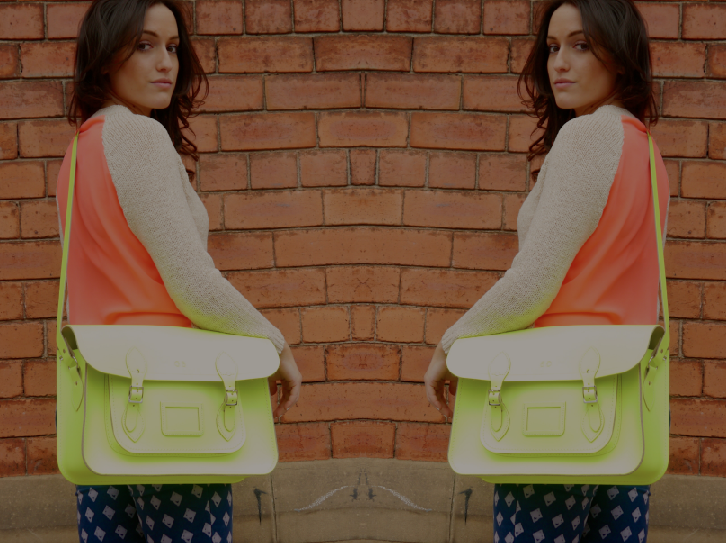 I've had my eye on these satchels for a while now... yours looks fab so now I want one even more! Thanks for your comment on my blog :) I've followed you on Bloglovin. GOSH - your neon satchel is awesome, love it! !